Who runs the show around here anyway? You — or God? Deciding this once and for all is a constant life challenge. “Don’t believe in other gods” is the prohibition against believing that there is any power in the universe outside of God. It is understandable how a positive action — like awareness of God or love of God — can be a constant mitzvah. 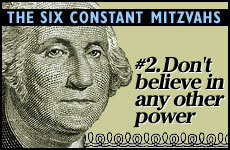 But how can a “thou shall not” be considered a constant mitzvah? Take the example of eating non-kosher food. If the travel agent forgot to order your kosher meal, and eight hours into the flight they’re serving juicy sirloin steaks, while all you have are peanuts and Diet Coke… then indeed, you are fulfilling the mitzvah against eating non-kosher food. But at this very moment are you fulfilling the mitzvah against eating non-kosher food? No! Fulfilling a negative mitzvah requires a situation where we’re faced with the temptation to violate it — and we overcome the desire to do so. Therefore: If “don’t believe in other gods” is a constant mitzvah, that means the temptation to believe in other gods is also constant! WHY IS THIS CONSTANT TEMPTATION? In Psalms, King David says: “There should not be inside of you a strange god.” What type of strange god lies inside a human being? The Talmud (Shabbat 105b) identifies this strange god as the Yetzer Hara — the self-destructive inclination within every human being to move away from God. The Yetzer Hara constantly tries to distract us from the fact that God is the only power in the universe. In a practical sense, “powers of the universe” refers to that which we believe is the ultimate arbiter of our success. Maimonides explains that idolatry is not a single step, rather it’s a process. In ancient times, when idol worship was a serious spiritual challenge, they’d carve a piece of stone and call it the “sun god.” They wanted to pay tribute to God as creator of the sun. But before long, they were worshipping the sun itself. They believed that something other than God was the ultimate source of strength and salvation. People start off focused and clear on the priorities of life. But then we get sidetracked. Today, although classical idol worship is no longer much of a problem, it’s not uncommon to believe that money, fame, stock options, a fast computer, or good looks is the source of fulfillment and happiness. And that’s idolatry! What’s more is that today, we have an even greater challenge: Will we attribute our success to God — or to ourselves? I’m smart. I’m tough. I’m rich. Who needs God? Which of these two statements is accurate? The statement of “I can’t” is more accurate. Because in truth, “I” can’t do anything at all. Only because God gives me the power am I even able to tie my shoes in the morning! Don’t believe that taking credit for your achievements will give you confidence to undertake more things. On the contrary, you’ll quit much faster. Let’s examine the three common areas where people inappropriately take credit for themselves: 1) natural abilities, 2) accomplishments, and 3) goodness. Huh? You mean you want me to be impressed because of your eyesight?! As ludicrous as it is, people often take credit for the natural abilities they are born with. A genius tends to think he’s superior to everyone else. But is he is any better than someone with 20/20 vision in a room full of people wearing glasses? Or how about when you’ve got a fever, your teeth are chattering — and your roommate boasts, “Me? I never get sick! I have an iron constitution!” Argh! People who are beautiful or intelligent have great temptations to be arrogant, since society places such high value on these qualities. We’re not suggesting that beautiful people should scrunch down. But how can you take credit for something you didn’t work to develop? Don’t ever let your natural abilities become a source of arrogance. Instead, thank God for the gift. What is he proud of? He didn’t do anything to earn the million dollars! It’s the same when we actualize our potential. We are applying our natural talents to something we want to achieve, something that makes sense. It is as though we are cashing a million-dollar check. The artist, brain surgeon, and musician are all using their God-given talents to “cash in” on a great career. If the Almighty wouldn’t have given them the talent to paint, the steady surgical hand, or the ear for music, they could not have achieved anything. Of course to achieve results, a person has to invest some effort. But the raw materials — and the circumstances which enable those to be applied — are all provided by God. It’s tempting to say, “Look what I did.” But that’s taking credit for “cashing in the check.” Instead, thank God for the opportunity. This is like someone who takes pride in being a good person. You didn’t destroy your life by becoming corrupt? You didn’t waste time? You didn’t get angry? You didn’t take revenge? What are you taking credit for? You simply avoided harming yourself! Imagine a young man enrolled at Harvard University. His parents pay $20,000 for a top education. But the guy gets drunk, sleeps late, ignores his studies, and now he’s flunking. His father is desperate and makes a deal with his son: “If you get a ‘B’ average, I’ll buy you a new BMW.” This guy wants the car so badly that he buckles down and gets a “B” average. What?! He worked hard for his own benefit — to get a good education! Sure, the BMW was an incentive, but if he understood the priceless gift of education, that alone would have been sufficient motivation. Through mitzvot, the Almighty gives us the opportunity, the ability, the incentive, and the ultimate reward. When you do a mitzvah, you are doing something good. Human beings desire meaning and spiritual pleasure. Through mitzvot, the Almighty gives us the opportunity, the ability, the incentive, and the ultimate reward. All we have to do is use our God-given strengths to take advantage of the opportunity. So don’t take credit for being good. Instead, thank God for the gift. Isn’t it really our pleasure after all? One way to avoid inappropriate pride is to put your accomplishments into perspective. Imagine a man buys a ramshackle tenement from the city for $10,000 dollars. He invests another $10,000 to level the place, then turns around and sells it for $80,000 dollars as a parking lot. The man is thrilled. He can’t stop bragging about what an astute businessman he is. Until he hears that the parking lot owner turned around and sold the land to a shopping center developer for $10 million dollars! Now how does the first man feel? Is he still going to brag about his great business sense? When we feel pride because we give charity, honor our parents, or learn Torah, we’re like the man who brags about selling the land as a parking lot. When we finally get upstairs and see what we could have achieved, we’ll realize that our actual accomplishment is just a drop in the bucket. Instead of feeling pride, we’ll feel regret. Should we take pleasure in what we’ve done? Of course! But not to the point of becoming smug and complacent — and forgetting how much more we’re capable of. Put your accomplishments into perspective and never stop focusing on how much more you could be doing. You can never be sure you’ve done even a small percentage of what’s possible. Even though God is responsible for everything that occurs in the world, part of the system He set up is that we have to make an effort. It’s a precarious balance. We have to work to earn a living, but at the same time realize it’s God Who provides. Thinking that hard work will makes you rich is believing in other gods. The question is, how much of an effort do we have to make — versus how much can we rely on God to make it happen? (In Hebrew, this balance is called hishtadlut versus bitachon.) If the Almighty wants me to be rich, I’ll be rich. If he wants me to be poor, I’ll be poor. So what’s my role in this whole deal? The precise amount of effort differs from person to person. An effort that is fine for one person may be entirely inappropriate for another. It’s a sliding scale which varies according to the individual’s level of trust in God. An effort that is fine for one person may be entirely inappropriate for another. Let’s take the example of buying a lottery ticket. If a person looks at a lottery ticket as nonsense, saying, “I need to work to hard, that’s the way to earn a living,” then buying a lottery ticket would not be an honest effort for him. Chances are it won’t pay. A second person says, “The Almighty runs this world. But if I want to become a millionaire, I can’t just sit around waiting for the mailman to deliver the check. I have to give the Almighty a way to send it to me. And a lottery ticket is a good way!” For this person, buying a lottery ticket is an appropriate effort. The third person says, “The Almighty runs this world. He doesn’t need me to invest a dollar for a lottery ticket in order to make me rich. I’ll pray and learn Torah and God will take care of my needs.” If a person really sees God’s supervision of the world with such clarity that he knows there is no direct correlation between the effort and the success, then he doesn’t even need to invest a dollar for the lottery ticket. Consider the story of Joseph in jail. In Genesis chapter 40, Joseph is imprisoned in Egypt together with Pharaoh’s butler. As the butler is about to be released from prison, Joseph asks him to appeal to Pharaoh for his release. The Talmud says that because Joseph made the mistake of relying on the butler, Joseph had to remain in jail an additional two years. As it says: “Better to trust in God, and not in vain pursuits” (Psalms 40:5). What does this mean? Wasn’t Joseph a tzaddik who trusted wholeheartedly in God?! If you or I would have asked the butler to intervene, it would have been appropriate. But Joseph’s understanding of the absolute power of God was so intense, that using any means other than God to obtain his release was a mistake. To Joseph, asking favors of the butler was as absurd as grasping at straws to prevent drowning. So should you buy a lottery ticket? It depends. The right proportion of effort depends on your level of clarity that God runs the world. That will determine your position on the sliding scale of effort versus trust in God. They went down to the market, and walked from end to end. On the way back, someone came over to my uncle’s friend and offered to sell him some merchandise wholesale. Nobody approached my uncle, so he headed back home to learn Torah. When he arrived home, there was an Arab waiting with three sacks of wheat. The Arab said he had to leave town and needed someone with whom to trust his wheat. He gave the wheat to my uncle and said, “Sell it for me and you’ll get a percentage.” Instant income! We have to make a reasonable effort. At the level my uncle was on, walking through the marketplace was a reasonable enough effort. When it comes to mitzvot, how much effort should we make? Unlimited. The Talmud (Avot 5:26) says, L’fum tzara agra — “according to the effort is the reward.” This means that every effort you make to do a mitzvah is rewarded. So go all the way! Even if it seems like you’ll never accomplish your goal, you can’t lose by trying. And you never know… the Almighty might make a miracle to help you accomplish what seems impossible. Why did Batya stretch out her arm when Moses seemed impossibly far away? Was she making an inappropriate effort and relying on a miracle? She wasn’t relying on a miracle at all. She saw a baby in the river and instinctively stretched out her arm to save it. It was a knee-jerk reaction of caring. If you saw a child running in front of a car, you’d stretch out your arm, even if the child was too far away. If you care, you react. And God rewarded Batya’s caring with a miracle that helped accomplish her goal. Work within the system, because God doesn’t like to make miracles if He doesn’t have to. When it comes to doing mitzvot, there’s no limit to how much effort you should make. For Batya, she only had one moment to react, so all she could do was care. But in general, we need to use our head to come up with a sensible way to accomplish the goal. Work within the system, because God doesn’t like to make miracles if He doesn’t have to. Keep at it, use your head — and the Almighty will help you find a solution. If you’re no longer battling with your ego. If you understand that it’s all a gift. If you realize that ultimately, you have no independent power. The Talmud says there are three levels of humility — i.e. three levels of understanding that there is no power in the world other than God. King David represents one level. He said, Anochi tola-at v’lo ish — “I am a worm, not a man.” David saw himself as a lowly, living creature. The worm is practically helpless, except for that the fact that God gives it the power to move. As king, David had to strategize and make decisions using his head. So he still saw himself as “something,” even if it was just a lowly worm. Abraham is the next higher level of humility. He said of himself, Anochi afar va-aifer — “I am dust and ash.” Abraham recognized that his role in this world was to teach people about a God who loves them. He saw himself as a pipeline, an inert object. He was dust — still maintaining some intermediary function, no matter how insignificant. The highest level of humility is Moses, who said, Anachnu mah — “We are nothing.” He attained the ultimate understanding that there is nothing other than God. Not a worm, not even dust. Moses received the Torah from God, and transmitted it to the Jewish people. As such, Moses could not allow his personal self to corrupt the pure truth of the Torah’s message. A primary goal in life is to achieve the understanding that there is no power outside God, and that anything we’ve accomplished is because God willed it to be so. This is the essence of “don’t believe in other gods.” And it is a constant mitzvah because we have the constant urge of theYetzer Hara working against us. May we have the strength and clarity to overcome it.